Get the latest PD Update! The Professional Development Update is an Alliance for Kids monthly e-newsletter providing training, event, and other professional development opportunities in one spot. Our goal is to allow plenty of time for you to sign up and stay informed. Please share this email with others and be sure to visit us on Facebook . Our PD Catalog includes information about all upcoming AFK training through June 2019. You will find training descriptions, clock hours, domains, credential/PDIS, registration links, and trainer information. Want to become Early Childhood Teacher qualified in a jiffy? Child Care Development Specialists in El Paso County! Do I have to take classes at Red Rocks Community College? No, if you choose to take ECE101 as part of your apprenticeship, you can choose from any accredited college, including online classes. Am I required to take college classes as part of the apprenticeship? No, you can choose other training options that will allow you to get the outlined educational/training components of the apprenticeship. Is it true that I can get paid to be a part of this apprenticeship? Yes it is! There is money to pay for your education/trainings as well as a stipend to cover the cost of books, child care, mileage or other expenses related to the apprenticeship work. There is also money for your mentor teacher and your center! Why would I be part of this apprenticeship rather than doing trainings on my own to get qualified? The apprenticeship is a unique program that allows you to gain knowledge and paid on-the-job experience to support you in becoming early childhood teacher qualified. You also get a mentor to help you plan your career along the way and help you address any challenges that you are running into as a teacher. This apprenticeship helps to build community where you are already working! I already have some education and experience, will this be counted? Yes it will! You will be asked to turn in documentation of this which will be used to help customize the apprenticeship for you. Click here for flyer and registration details. Registration for the Spring 2019 Pyramid Plus Approach Training is now OPEN. Participants will receive 48 hours of training and learn how to support the social and emotional health of our community's youngest children. For addition information on Pyramid Plus Approach, visit the AFK website . The Teaching Pyramid Observation Tool (TPOT) reliability workshop prepares participants in the use of the instrument to gather information on preschool teachers' implementation of Pyramid Model practices. This is an intensive workshop that requires prerequisite knowledge, preparation and participation in the entire workshop. For full details, click to view the flyer . Deadline to register is March 5th. Do you want to increase child engagement during circle time? Learn how to promote early language and literacy, child development and school readiness, and community building by incorporating playful music and movement activities into your circle time! Please note : Learning supports will include the Music Play for Story Time and Beyond Training and FREE follow-up coaching for teachers and administrators. New Pre-Licensing Classes are Available! F or more Pre-Licensing info, click here or download flyer . Abusive Head Trauma now available in Spanish! The Office of Early Childhood is now offering an online Spanish Version of Preventing Abusive Head Trauma. This course - Prevención del traumatismo craneoencefálico por maltrato o síndrome del bebé/niño sacudido - is available for free from the Colorado Shines PDIS. This is a one-hour, Pre-Service and Orientation course. Come join us and learn more about; Playground Supervision; Age-Appropriate Equipment; Fall Surfaces; and Equipment Maintenance. Learn some fun facts and why this is important for our children. Click here for flyer. Psychological First Aid (PFA) is a participant-centered training that builds resilience by teaching participants how stress affects the body and brain, how to recognize stress reactions in themselves and others, and the nine core actions of PFA. The nine core actions of PFA are tangible actions participants can use to help decrease stress and increase adaptive functioning while engaging with people, especially in an emergency or disaster environment. The four-hour training is skills-building, giving folks the opportunity to practice what they've learned. Culture of Wellness in Preschools (COWP) is offering FREE 2-hour professional development training for home- and center-based programs interested in learning how to implement healthy eating and physical activity policies. Click here to view flyer. The Early Childhood Council Leadership Alliance (ECCLA) is the new home for the T.E.A.C.H. 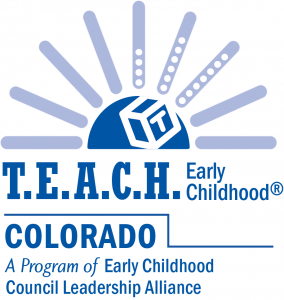 Early Childhood® COLORADO Scholarship Program (T.E.A.C.H.)! ECCLA is excited to administer T.E.A.C.H. and explore new opportunities to engage our state’s early childhood workforce. A seamless transition of the program is currently in progress and ECCLA recently welcomed Shannon Hall as Manager of Scholarships. ECCLA is the membership association for Colorado’s 34 Early Childhood Councils. They support our Early Childhood Council by providing technical assistance and capacity building, implementing shared measurement, advocating for policies affecting early childhood, and leveraging statewide partnerships. For more information on T.E.A.C.H., please contact Shannon or call (720) 899-3047. Visit ECCLA’s website for program eligibility and application opportunities. Are you a coach in El Paso County that is in need of Reflective Supervision? Please contact Kelly Hurtado to find out more about local opportunities to engage in this professional development for coaches. Is it time to renew your Early Childhood Coaching Credential? Level 1 coaching credentials must be renewed every three years. Level 2 and 3 applications must be renewed every five years. The Coaching Credential Application Checklist guides individuals through the renewal process and helps to monitor the completion of required tasks and documentation for your application. It is important to remember that a renewal does not require an application for a higher credential level. Keep in mind, your coaching credential will remain in good standing as long as the complete renewal application is submitted for processing by the credential expiration date. The credential processing timeline is unchanged. Applications received by the 15th of the month will be processed by the 15th of the following month. The Pikes Peak Small Business Development Center offers training and consulting with local business experts for existing businesses as well as those looking to start businesses. This is a great resource for early childhood owners and directors to connect with consultants, workshops, and resources related to running a successful small business. You can pay for this conference with your CSQI Funds! ﻿Registration for the 2019 Rocky Mountain Early Childhood Conference is now open! With over 150 sessions, there’s sure to be something for every early childhood professional. The conference will take place March 1-2 at the Sheraton Hotel in downtown Denver. Register here and visit the conference website at www.rmecconference.com for more information. A Continuing Education Unit, referred to as a CEU, is a non-credit training. It is not designed as a credit program, nor does it meet the credit requirements particular to a degree program at a college or university. The primary purpose of the CEU is to provide a permanent record of the educational accomplishments of an individual who has completed one or more significant non-credit educational experiences. In a continuing education program, one CEU is equivalent to 10 contact hours. Contact hours are the number of hours you are “in contact” with an instructor. When pursuing CEUs to earn points towards your Early Childhood Credential in The Colorado Shines Professional Development Information System (PDIS), the CEU must have the International Association for Continuing Education (IACET) logo or be from a regionally accredited college/university. Address Cultural Competence, Children with High Needs, Social Emotional Development, or a basic understanding of Research as these topics are embedded within the Early Childhood. Competencies. Before spending money on a CEU training, make sure it meets the PDIS criteria. If you have questions about this or would like assistance with finding CEUs that count in the PDIS system, please contact Erica Evans. The new requirements will be in effect starting December 1, 2018. The PDIS team would like to ensure all applicable Early Childhood Professional Credential submissions are accepted and earn points towards the Credential. With this in mind, the team further defined the requirements documentation must include to earn points. Good news, most submissions already follow these guidelines! Professional development providers who wish to implement these changes early are welcome to do so. This will also ensure the ongoing professional development documentation is accepted toward the Credential. For more information, an optional training certificate template, a requirements checklist, informational flyer with FAQs and a multi-use article, click here . You can also access this information from the left navigation menu in PDIS, called ‘Ongoing Professional Development Documentation.